Ronnie James Dio died at 7:45am this morning after a 6 month battle with stomach cancer. 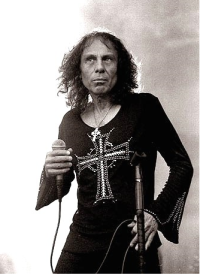 Ronnie had performed in a number of bands, most notably with Black Sabbath taking over from Ozzy Osbourne and with his own band Dio. He embraced the mythological themes of metal with dragons, castles, swords, magic and damsels featuring heavily in the lyrics, videos, and stage shows. Back in the day there was a myth he had an English castle transported over to the US. Not only was he the driving force behind a number of great albums and bands, but he was also a genuinely nice guy, heavily involved in the Children of the Night charity for teenage runaways. Recently appearing on The Metal Show, in the last 2 minutes of this clip Ronnie explained why he treats fans so well, after seeing the disregard Ritchie Blackmore had for fans. After 20 years, this guy is still one of my favorite metal icons that embodies a large piece of what Heavy Metal means to me.